Thank you so much for taking the time to do this for me! I really appreciate it. So tell me, at what age do you remember first being interested in music? When did you decide it was something you wanted to do as your career? At age two and a half I loved to sing and listen to music. I was about 10 when I realized I wanted to do it for a career – I realized not only did I like to sing, but people seemed to like to listen to me. When I graduated from college I thought no one would pay me to be a musician - luckily that turned out not to be true. When I was a kid it was Julie Andrews for singing and acting. I felt so inspired by seeing the musicals she was in. I have a ton of respect for Paul Simon and I think he’s an amazing musician as well as poet and composer. I find his songs sprinkled throughout my life – I want to sing them as part of my day a lot. I also love Neil Young, Joni Mitchell and Joan Armatrading. We're definitely on the same page there! Music seems so natural for you. What was the first instrument you learned to play, and how many do you play now, besides guitar of course! I remember that in school, at about age 6 we all played recorder, but the first instrument I took lessons on was the piano. I started when I was 7 and continued my lessons for about 8 years. I also learned clarinet and violin, playing in school band and orchestra. I always wish I’d learned to play drums. I think the recorder is a rite of passage on the East coast! I know you started out in an adult band. How did you make the decision to begin playing music for children? I had a job as a preschool music specialist and found that I was both feeling more creative and getting lots of great feedback from writing music for kids. I felt more satisfied than playing in the “adult” bands, so eventually I switched over. Was making the transition from adult band to the children’s set full time hard to do, and how did you realize that was where you wanted to be? It wasn’t hard. I remember the gig that made me want to switch fully to just playing kids’ music. I was feeling really sick and had gone to Long Island to play a late night show. Then I had to get up really early to play for a kids birthday party the next morning. Even though I felt lousy, I enjoyed myself at the party, whereas at the show the night before I remembered wishing that I didn’t have to be there. I realized I didn’t want to switch back and forth anymore. Something else that really made it clear to me was when I played at the birthday party, I played music I wrote myself that the kids and parents were requesting and loving. And all the kids were dancing. This was so different from the the night before, when I was trying to figure out what cover songs the mostly apathetic audience wanted to hear. I'm not surprised to hear that parents were requesting songs as well as kids. I hear from a lot of parents, and all of them (including myself) really enjoy listening to your work. Our children are big fans as well. Why do you think your music style appeals to adults and children alike? Most music seems to fall into one or the other category. I try to come from my own feelings and memories when I write, both in the lyrics and the music. I think that helps me to combine both the child and adult sides of myself, and hopefully appeal to other kids and adults. I also try to write music that I want to listen to myself – repeatedly! With kids, "repeatedly" is the magic word! Where do you find inspiration for your music? Aside from my own memories of being a kid, I listen a lot to children around me. I did that a lot when I was in school working directly with kids, and now I do it more sitting on the bus or at playdates with my daughter and her friends. Also, If I find something cool I think, “Did I think it was cool as a kid too?” If I did, then it’s something to consider writing about. We first discovered you on Nick Jr, on Jack’s Big Music Show. How did you become part of that show, and is it difficult working with puppets? I think I’d keep looking at the puppeteers! I was asked to make a video for the pilot because they knew it was going to be a music show. Originally we were only slated to be in a few episodes, but the response was so positive during the testing period they asked us to be regulars. Most of the videos were filmed completely separately from the show (we were in NYC and the puppets were in Chicago). The few times I was on set I didn’t really see the puppeteers;, they were below me. What was actually most difficult was that because of camera angles I wasn’t even supposed to look at the puppets. I had to pretend in order for it to look realistic. It was quite difficult looking at nothing. Tell us about My Family. As adoptive parents, we find a lot of meaning in the lyrics. Is there a story behind how you wrote it? Nick Jr. asked me to write a song with the theme “family” and I realized that I have a lot of strong feelings about what family actually means. To me personally, it’s not just the people that you’re born to and I wanted to find a way to express that, that love is truly what makes a family. I was also very aware that every family is different, and I wanted to write a song that would hopefully represent all families, no matter what they look like. The video for My Family is fun. Our daughter Sabrina dances along to it just like the kids on TV. Where did you find the families for the video? I didn’t actually, that was all Nick Jr.
We did get some emails and calls, but not too many. I was glad about that because it really made me feel angry that people felt righteous about who they thought should be allowed to be on a video. . . a video about FAMILIES! I mean, who has the right to decide what other people’s families should look like? You do a lot of charity work. What charities are near and dear to your heart? Oy, the list is long. I usually choose to do a lot for children-centered charities through my music, and I particularly love having worked with CHOP (the Children’s Hospital of Philadelphia) and meeting some of the amazing kids who have been treated there. There are also a few groups that I always find myself donating to personally that I don’t talk about as much. They are: Heiffer International (they give animals and training to families in order to provide better nutrition and ways of generating sustainable income), FINCA (which microfinances low-income entrepreneurs in countries all over the world), The WCS (Wildlife Conservation Society which saves wild places and animals all over the globe as well as running the NYC Zoos and Aquarium) and two NYC based charities, NYRP (The New York Restoration Project, founded by Bette Midler rebuilds public spaces and parks in NYC that have deteriorated from years of neglect) and Riverkeeper (New York’s “clean water advocate”, they are also dedicated to protecting the Hudson River). My toddler stops dead in her tracks whenever she hears your music. What is it like having Laurie Berkner for your mom? You’d have to ask my daughter that one! What’s next for you and your band? Our new DVD, “Party Day!” will be released in July. It’s going to be packaged with a bonus CD that has a new, acoustic version of the “My Family” song. 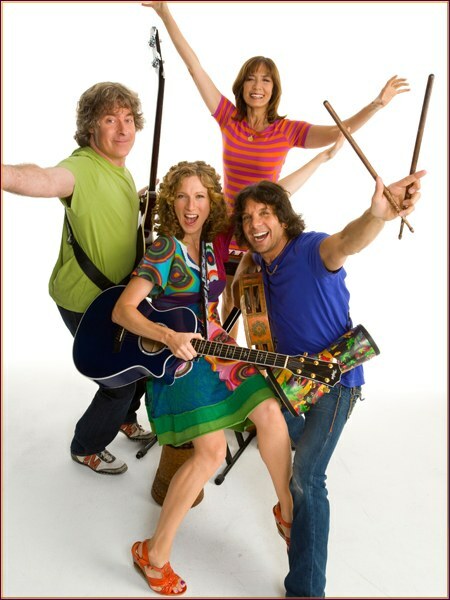 What is your favorite Laurie Berkner song? Hmm, it always seems to be the latest song I’ve written. Right now it’s “Party Day,” the title track for our new DVD - so you’ll have to buy it and find out what it sounds like! I’ll end with the toughest question: Elmo or Barney, and do you know either of them? Elmo. I can’t say that we hang. He’s never invited me to tea. I can talk like Elmo, by the way. Ask me to do an impression sometime. I know I'll be first in line (OK at amazon.com) for Party Day when it comes out! Please leave a comment below and tell me what you think of the interview, and if you're a Laurie fan. Trust me, listen to her once or catch a video on Nick Jr. and you'll be hooked. Now, where is my iPod...? That was great! We're big Laurie Berkner fans at our house too. Can't wait for the new CD! Seriously Bobby, how the hell did you swing that? Flipping awesome. Lets see on Bean's 2nd b'day party mix that I had playing we had Victor Vito, Bumble Bee and Pig on Her Head. What a great interview! Nice job! I've never heard her before but will check her out. Love the "Family" vid, too, with our daughter. Pretty cool interview, Bobby! I just found your blog through the LBB Facebook page and have enjoyed spending the last hour or so catching up on your journey. You have a beautiful family. Congrats to all!! Awesome interview! Found it through LBB Facebook page. My kids adore Laurie too. Thanks for sharing! GOOD TO KNOW! Thank you so much for the tip! Great interview - loved rading it! Thanks. Subscribe and Follow Our Journey!